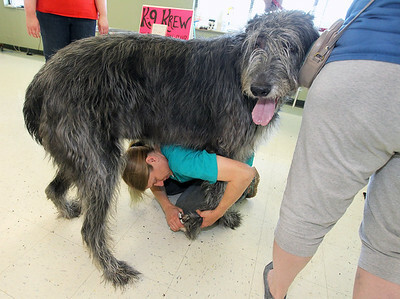 Candace H. Johnson-For Shaw Media Sandy Coffell, of Round Lake Beach with the 4-H club, All in Ag, trims the nails of an Irish Wolfhound named, Hooligan, during the Lake County Pet Vaccination Clinic at the Lake County Fairgrounds in Grayslake. 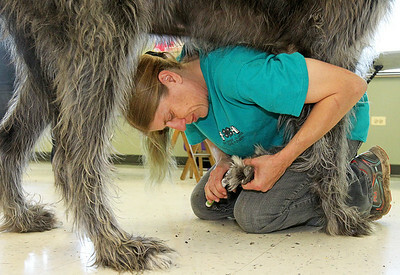 Hooligan's owner, Linda Wozniak, of Round Lake Beach stood close by. Candace H. Johnson-For Shaw Media Hannah Felipez, 19, of Gurnee and her mother, Julie, hold on to Peanut, their Rat Terrier, as Dr. Lew Seidenberg, with Lake County Animal Control gives him rabies and distemper shots during the Lake County Pet Vaccination Clinic at the Lake County Fairgrounds in Grayslake. 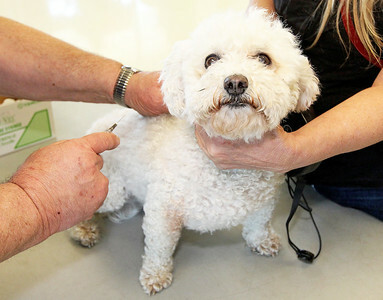 Candace H. Johnson-For Shaw Media Dr. Lew Seidenberg, with Lake County Animal Control gives rabies and distemper shots to Snowball, a Bichon Frise, as her owner, Jeannine Kaczmarek, of Fox Lake holds on to her during the Lake County Pet Vaccination Clinic at the Lake County Fairgrounds in Grayslake. 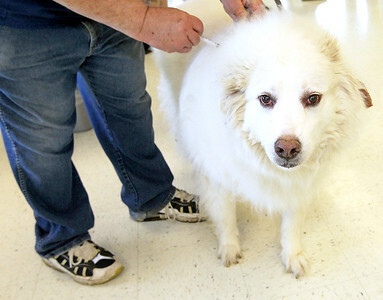 Candace H. Johnson-For Shaw Media Dr. Lew Seidenberg, with Lake County Animal Control gives rabies and distemper shots to Dakota, a Great Pyrenees, during the Lake County Pet Vaccination Clinic at the Lake County Fairgrounds in Grayslake. Dakota is owned by the Kunde family of Lake Villa. Candace H. Johnson-For Shaw Media Aaron Dominguez, 10, of Beach Park waits on line to get a rabies shot for his Chihuahua named, Pitufo, during the Lake County Pet Vaccination Clinic at the Lake County Fairgrounds in Grayslake. 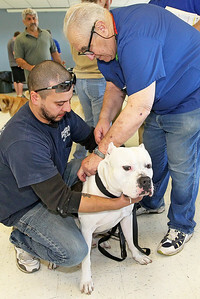 Candace H. Johnson-For Shaw Media Omar Medina, of Gurnee holds on to his Pit Bull named, Dice, as he gets rabies and distemper shots by Dr. Lew Seidenberg, with Lake County Animal Control during the Lake County Pet Vaccination Clinic at the Lake County Fairgrounds in Grayslake. 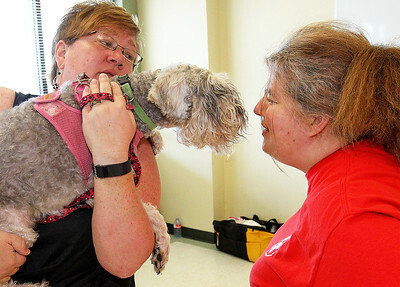 Candace H. Johnson-For Shaw Media Jenni Etherington, of Round Lake Park holds her Schnoodle, Gabby, as she visits with Holly Hendershott, of Round Lake with the 4-H Club, K-9 Krew, after she got a microchip during the Lake County Pet Vaccination Clinic at the Lake County Fairgrounds in Grayslake. Candace H. Johnson-For Shaw Media Sandy Coffell, of Round Lake Beach, with the 4-H Club, All in Ag, holds two Chihuahua puppies named Brownie and Bella, owned by the Avila family, of Round Lake before she cuts their nails during the Lake County Pet Vaccination Clinic at the Lake County Fairgrounds in Grayslake. 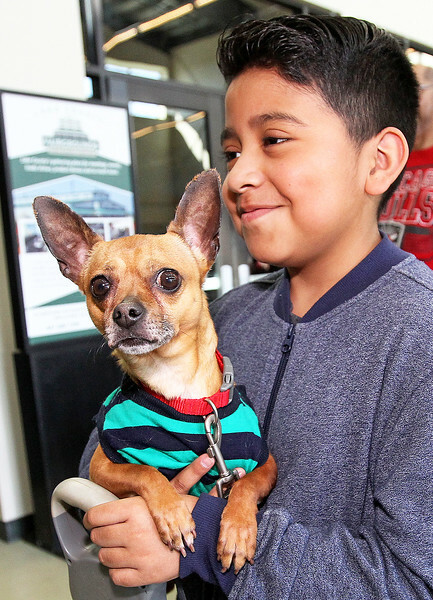 Aaron Dominguez, 10, of Beach Park waits on line to get a rabies shot for his Chihuahua named, Pitufo, during the Lake County Pet Vaccination Clinic at the Lake County Fairgrounds in Grayslake.